Q. What is the difference between low voltage lighting and the lighting I’m now using my home? A. Traditional or the most commonly used light sources are powered by a 20 volt current. This is known as line voltage and is the standard current. When you plug something into an outlet you’re accessing 120 volt current. Low-voltage lighting operates on a 120 volt current. This is similar to the amount of electricity used by a car battery. 12 volt is much safer and more energy efficient. Q. Why should I use professional quality equipment over the cheaper home store versions? A. Professional quality fixtures and equipment offer better construction. Materials like copper and stainless steel usually have extensive manufacturers’ warranties. There is a wider variety of professional quality equipment to allow a designer to choose specific fixtures that will best serve your particular landscape with many more lighting options for your home and or property. Q. What are some examples of knowledge the professional has that may not be apparent to the do-it-yourself installer? A. There are concerns regarding voltage drop and maintaining the same voltage, which results in different light intensity in all fixture locations. There are specific lighting, techniques like grazing or backlighting that may prove to be perfect for a particular application that you may not be aware of. Designing cable runs, specifying particular lamps, color temperatures, beam spreads, and using and installing specific control options are things not known to the do-it-yourselfer. Q. What kind of control options are available to me? A. There are remote options, dusk to dawn operations using light sensing photocells, timers and more available through the use of professional equipment and a professional installer. Q. Besides fixtures what kind of equipment is necessary? A. The heart of any low voltage lighting system is the transformer. The transformer is a necessary component that reduces the 120 volt current from your home into the 12 volt current necessary to operate the lighting system. Q. What are the costs of professional lighting system? A. Costs depend on the number of fixtures specified, the size of your property and the purpose of the system. You can be assured that the cost of a professional system. The expense is offset by the extended life and added enjoyment available from a professional system that creates more appealing and diverse lighting effects. When compared to line voltage alternatives, a low voltage is far more economical in the long run lowering operating expenses and per fixture costs. Q. What are the main benefits of a professional lighting system? A. 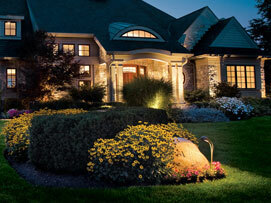 The most apparent benefit is the added beauty a low voltage lighting system brings to the landscape. 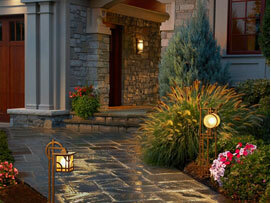 Equally important are the simultaneous benefits of adding home safety, security and value. 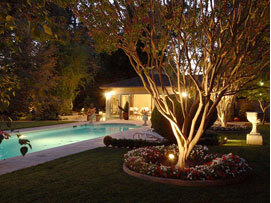 By adding light you extend many usable hours of your property and enjoy the outdoor areas of your home. Q. Will installing a lighting system tear up my yard? A. Aqua Guys can incorporate a lighting system into your existing landscape with little or no disruption to the surrounding area. However, when possible it’s best to install the lighting system during the building stages of your home, landscape or pool.